Broach the topic of implants with this compact primer on the topic. 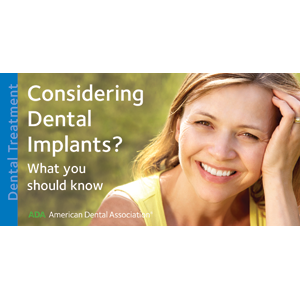 Mini-brochure summarizes how implants work, who can get them, and when they are indicated. Includes illustrations of both a single implant and implant bridge, plus updated steps of placement and healing. 6 panels. Minimum order 150. Click Add to Cart then personalize for free. Now you can add personalized information on the front, back, or both covers on all brochures.